It is time to take a good hard look at how you use your mobile phone. Deep down in the manufactures manual is an instruction to keep the phone away from your head. Depending on the manufacturer, the recommended distance could be 5 millimeters to 2.5 centimeters. Why this recommendation? This is so your phone use does not exceed the current regulatory safety limits for microwave radiation exposure to your head or body. 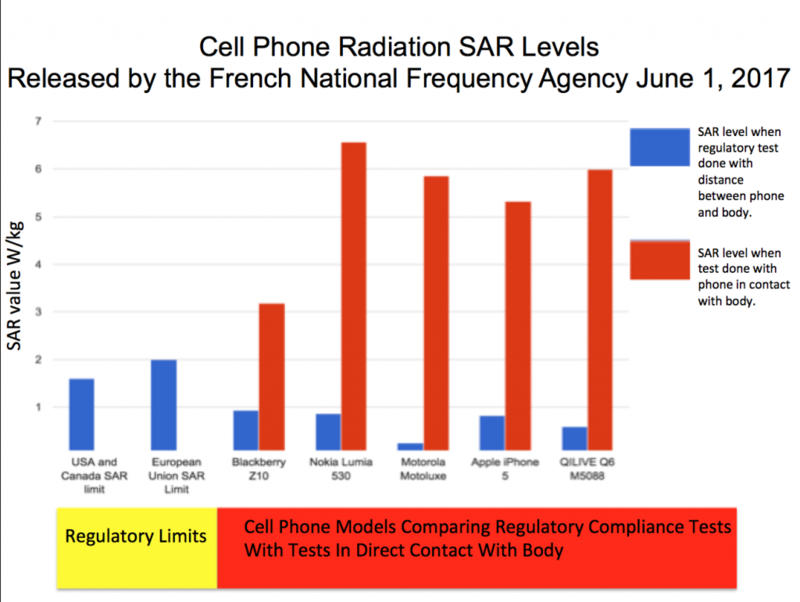 After months of legal action by French physician Dr. Marc Arazi, in June 2017 the National Frequency Agency of France (ANFR) revealed the 2015 test results of hundreds of cell phones. This ANFR study shows that if you use these phones like the majority of people do, touching the body, the phones significantly exceeded the government radiation exposure safety limits. The SAR value uses a standard 25 year old male head size to set the safety limit. This is a useless test when it comes to children because they have much thinner skulls, smaller heads and the protective myelin sheath hasn't developed over their brain neurones yet. 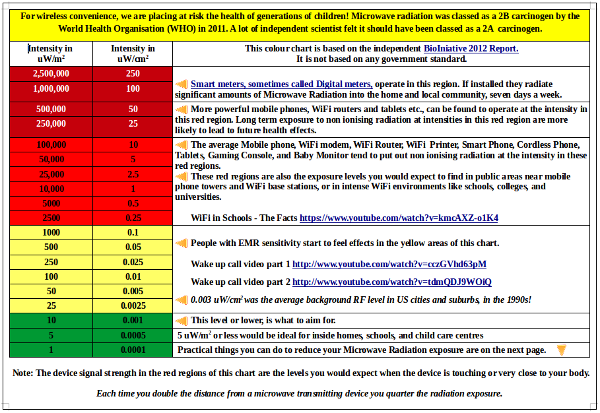 This means that any child's microwave radiation exposure is much greater than for an adult, when using a mobile phone. What level of exposure are children getting in the light of this new information? Independent scientists are ringing alarm bells about the health effects of these devices. Watch this 3 minute video. Why in California, did the CTIA, a wireless industry lobby group, sue the City of Berkeley for passing an ordinance that consumers be informed about the manufacturer's safety instructions to keep these devices away from your body? These safety instructions are deep down in the manufactures manuals. To assure safety, the Federal Government requires that cell phones meet radio frequency (RF) exposure guidelines. If you carry or use your phone in a pants or shirt pocket or tucked into a bra when the phone is ON and connected to a wireless network, you may exceed the federal guidelines for exposure to RF radiation. Refer to the instructions in your phone or user manual for information about how to use your phone safely. The industry went to a lot of expense to try and stop this information being in clear view. Isn't it your right to be made fully aware of this safety requirement? So why was there such strong industry opposition to prevent this information from being placed in plain sight? Here you will find the fine print warnings for different devices. WiFi Is Not Safe For Children! Disclaimer: This is an amateur volunteer run service. Human error can provide incorrect information, and equipment malfunction can produce false readings. Do not rely on, or take action upon information presented on this web site, without further research. Views expressed in the pages or images on the SCCC Inc., site maybe the personal opinions of the relevant writers, and are not necessarily representative of those of SCCC Inc.